The Kingdom of Serbs, Croats and Slovenes created in 1919 and confirmed in 1921 only recuperated a fraction of the once powerful and largely intact Austro-Hungarian Navy. However the new Yugoslav Royal Navy through purchases in France, Great Britain, and after a political shift, to Germany, managed despite the 1929 crisis, to constitute a small, yet capable fleet. Unfortunately, the operations of the Balkans largely happened on land, and the fleet at Kotor was almost entirely captured on 17 April 1941 by Italian troops. Thereafter many of these ships would see service with the Regia marina, and after September 1943, with the Kriegsmarine or the Nationalist Croat navy, whereas a new free Yugoslav Navy was created. Naval force of lesser rank, the Yugoslav Navy did not have less the outlet on the Adriatic of the former Austro-Hungarian Empire from which it came. In 1918, after the armistice, the Austro-Hungarian navy folded in Pola was to pass entirely under the Yugoslav flag, but the Treaty of Paris in 1920 was reworked on the authority of the Italians who did not wish the concurrence of a significant naval power in the Adriatic, and demanded that the remains of the fleet should be attributed to the victors of the war, including herself. As a result, only minor light units were given, some of them old, others newer but of low tonnage. 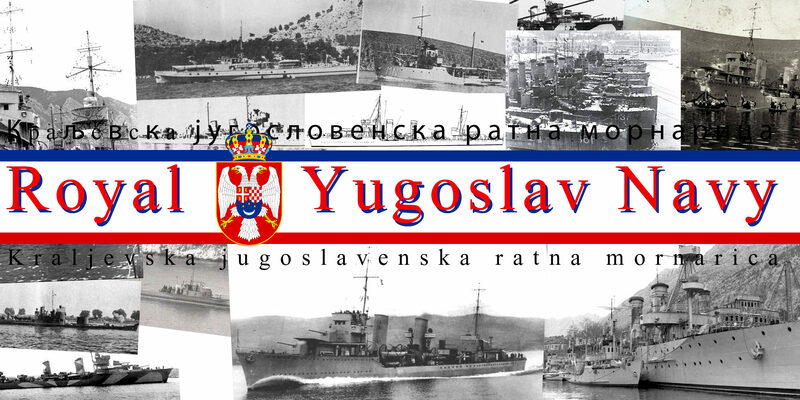 Thus, in 1920, the Yugoslav fleet received 12 relatively recent torpedo boats (of the Tb 74 and Kaiman Austro-Hungarian type), six of which were still in service during the German invasion of April 1941; 4 very old minesweepers, quickly scraped, and 4 river monitors. At the beginning of the year 20, she bought from Germany the cruiser Niobe which was renamed Dlamacija and 6 modern minesweepers type M.
In 1920, the situation of the young Yugoslavian kingdom started badly: Composite country born of the deliquescence of an old empire, it was in bad economic position and torn between the nationalist aspirations of the peoples composing it, in majority Serb, the latter having to contend with Croatian and Slovenian minorities. In 1922, thanks to the influx of foreign capital, the economic situation began to improve with the political stabilization of the country, but in 1929 a new deterioration began. Yugoslav Destroyer Leader Dubrovnik. British-built, modelled after the British 1918-21 destroyer leaders. Certainly one of the most capable destroyers in the Adriatic. The crisis prevented even the exploitation of what remained of imperial naval yards before the war. So she commanded her ships in Germany before voting for the meager budget for the construction of four new destroyers. Due to lack of funds, only the first was finally approved and built in Great Britain at Yarrow. 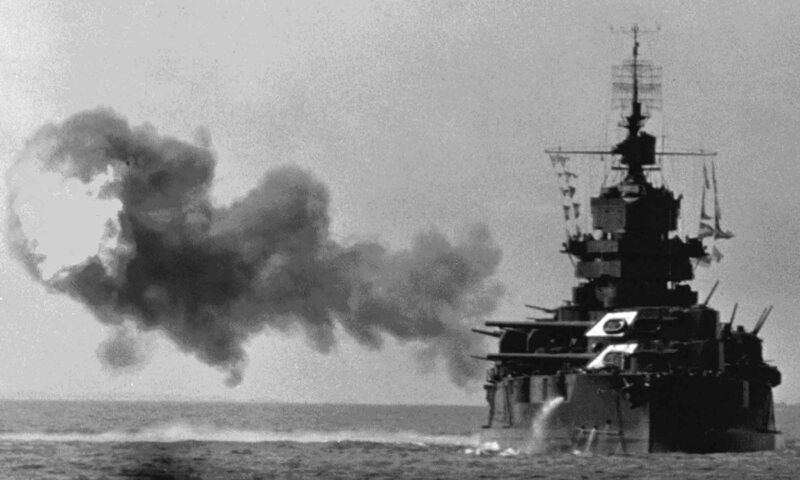 Known as Dubrovnik, it was in its time the most powerful destroyer in the world, and remained so in 1939. Four submersibles were also ordered, two in Britain and two in France, in 1926-27, and finally, three new smaller destroyers than the Dubrovnik also built on specific requests by French shipyards or on-site with close French supervision. At about the same time, a gunboat, which was also to serve as a Royal yacht, was ordered in Italy, and operational in 1940, the Beli Orao. The only locally built vessels (Krajlevika) were five small tankers of armed mines, originally started under the Imperial era, and completed by the Yugoslavs. Zagreb, one of the only three standard destroyers that made a half-flotilla led by Dubrovnik, called the 1st torpedo division in 1940. One was built in France and the two others locally under French supervision, combining czech armament, Dutch fire control systems and British powerplant. Orders were also placed in Great Britain for 2 torpedo launchers, and 8 others in Germany on the eve of the war. These choices reflected the uncertainty of Yugoslavia’s diplomatic relations in Europe, but around 1934, the legitimate King Alexander was assassinated in Marseille by the Croatian Ustasa, and the Regent Paul, who showed his sympathies with Hitler, seemed to tip the royal house the camp of the axis, which would have been annoying for the position of the British in the Mediterranean and for the Greeks. In March 1941, on the 27th, before the active rapprochement of the regent towards the Germans, a part of the royal family, supported by the population, chose to rise and bring to power the young Prince Pierre II, recently escaped from the Regency council installed at the Palace where he was watched. The Serb population, the majority, was indeed hostile to the Germans by tradition, turned rather towards the Russians. Yugoslav riverine monitor Vardar. Four ww1-era monitors were in service in 1941. Faced with Hitler’s coup as a provocation, he found the casus belli that allowed him to invade the country in order to help his Italian ally misguided in Greece since the winter of 1940. Operation “Marita” , modified to respond to a quick invasion of Yugoslavia which officially began the same day was at the beginning of April a new demonstration of “blitzkrieg” in which the Yugoslav fleet was torn between Croatian sympathies (Which came from a part of the officers and sailors) and Serbs, supporting the government in exile of Peter II. The Luftwaffe gave it to their heart’s content and almost the whole fleet was sunk or disabled in the first days. Some ships were captured, repatriated and integrated into the Italian fleet, others escaped. 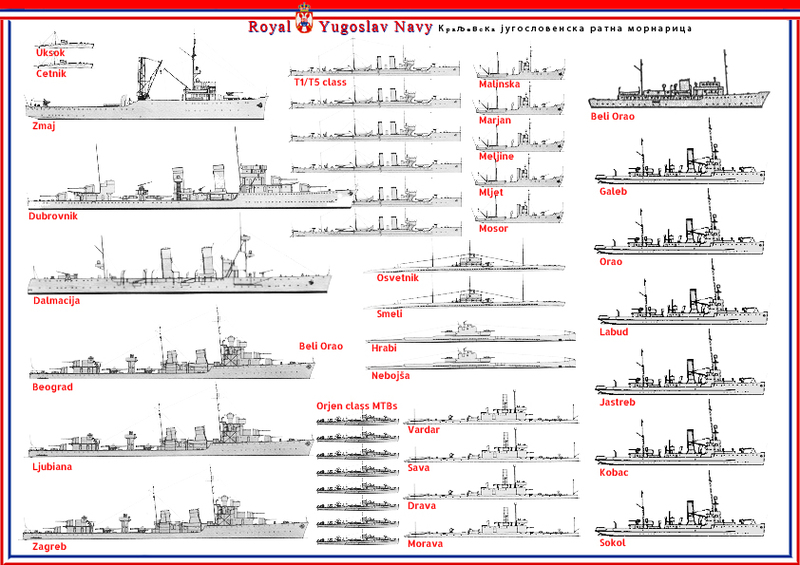 The Royal Yugoslav Navy in detail. All the classes in service in April 1941. A cruiser, the Dalmacija. 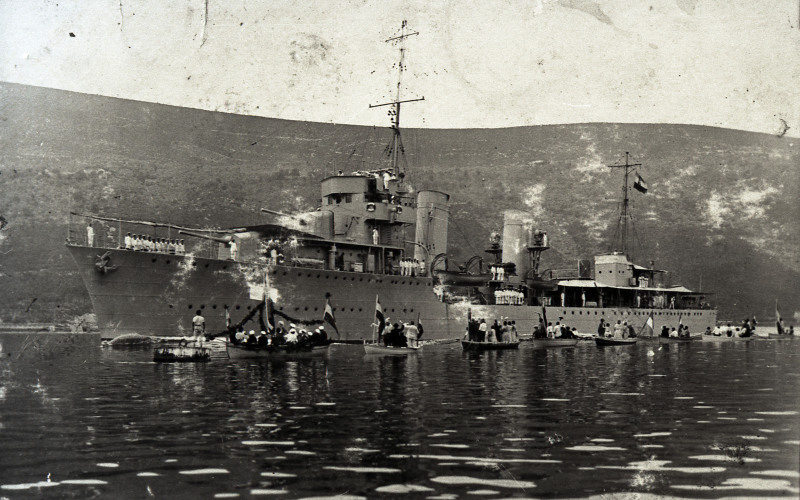 Schoolship in 1927 of the Yugoslav fleet because of her old age. 4 recent destroyers: Dubrovnik (1931), and the three Beograd class (1937-38). Dubrovnik served as flotilla leader. 6 torpedo boats: Formerly 74T class, (1914-16). Comparable to many coastal torpedo boats in Europe. 4 submersibles, French-built Osvetnik (1928) and the British Hrabi class (1927). 10 MTB Thornycroft CMB type (2 – 1927), and Lürssen (8 – 1939).